Open water swimming is a challenging sport that attracts all types of enthusiasts. Whether you're looking to compete or see some great sites while you swim, there's an open water swimming event for you. Triathlons give you a taste of open water racing. The distances vary between different events, but it's best to start race with a short-swim event. A triathlon swim takes place in the first part of the race and a triathlon is a great way to challenge yourself across many sports, and test your ability to conserve your energy and endurance. If you've been training in open water, then triathlons with an open water portion are a logical transition. Open water swimming relays include stage relays and competitive relays, which allow for a team approach in completing an open water distance. In a stage relay the total distance is covered in phases, by different members of a team, over the course of consecutive days. In competitive open water relays one swimmer completes a distance with the next swimmer completing the same distance in succession. Swimmers transition by tagging hands or simply swimming up to the next swimmer. Marathon swimming is the distance sister to open water swimming. For those not content with the challenge of variable water temperatures, choppy waves and other hazards, an ultra distance should meet the need. Marathon swims don't have to be a specific distance to be considered as such, but distances 5K and higher are generally considered marathon length. Marathon swim events can be found on OpenWatersource.com. A swim trek is a combination of swimming and a guided tour. Swim They are just like walking tours of new places, except you're in the water for multiple hours each day. SwimTrek, a company out of England, has been hosting events since 2003. According to the website, anyone can sign up and the tours cater to swimmers of various speeds and experience levels. Swim treks are not competitive, but if you're looking for a challenge, SwimTrek and other organizations do offer fast-paced tours. Connect with cold-water addicts at a polar bear swim—most often the shortest of any open water swim. You may have heard of these swims; just a quick jump in and out of the water, in the middle of winter in freezing temperatures. The swims are not the most challenging when it comes to using your distance or swimming muscles, but they're generally for charity and can be a great way to get acquainted with other open water swimmers. 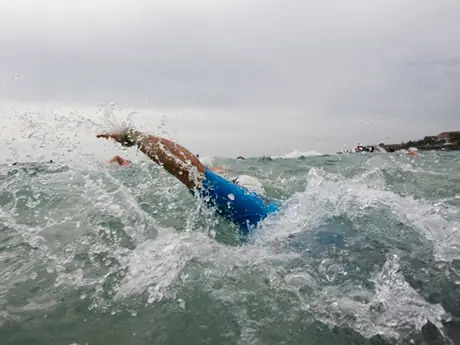 A world-class challenge like swimming the English Channel can be the first thing people think of when it comes to open water distance swimming. There are organizations and clubs designed to help people complete the English Channel swim and even swim it for charity. The 21-mile swim is possibly the most famous long distance, open water swimming event and definitely a challenging one. If you're an experienced open water swimmer, this is a great challenge to add to your bucket list. Search for a swimming event.